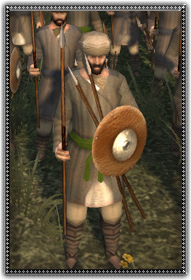 These are the men from the Persian hills and mountains. Used to fighting with a javelin to bring down animals for food, it's only a small step for them to start hurling their weapons at men instead. However, the creatures taken down by these men in the woods dont fight back, so a sturdy charge will likely be enough to break them and send them fleeing for the hill of their birth, unless a great general is on the field of battle to force them to hold their position at crucial times.